The first attempt to send a commercial spacecraft to the International Space Station was aborted less than a second before liftoff this morning, after an onboard computer detected a problem in one of its launch vehicle's nine engines. It was anticlimactic to see the engines of SpaceX's Falcon 9 rocket ignite, rumble, and belch out billowing plumes of smoke in the final seconds of this morning's countdown, only to hear their booming cut short and watch the engine exhaust evanesce over the Cape Canaveral launchpad; but in a NASA press conference held about an hour after the unsuccessful attempt, SpaceX President Gwynne Shotwell insisted that deciding to scrub the launch was intentional, and for the best. "This is not a failure," she explained. "We aborted with purpose. It would be a failure if we were to have lifted off with an engine trending in this direction." 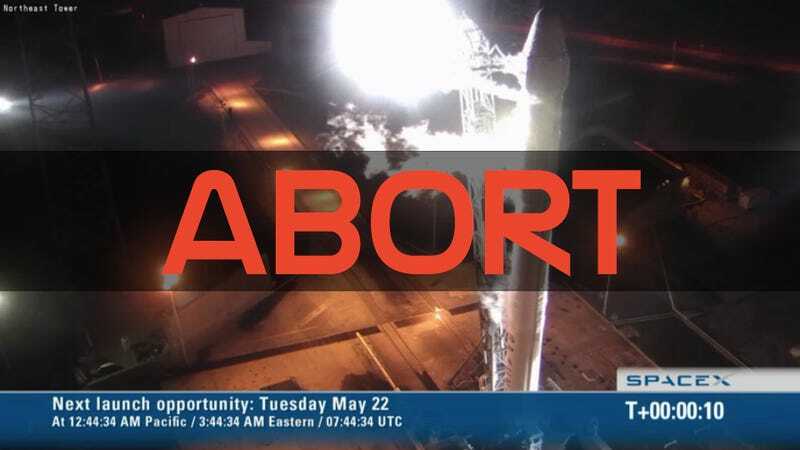 Just minutes after the Falcon 9's balk, SpaceX CEO Elon Musk had tweeted: "Launch aborted: slightly high combustion chamber pressure on engine 5. Will adjust limits for countdown in a few days." The Falcon 9 launch vehicle needs just seven of its engines to achieve orbit and send the unmanned Dragon capsule — the spacecraft that is slated to dock with the ISS — on its way, but it needs all nine for liftoff; if even one of the engines isn't operating as it should, the whole show gets called off. "The software did what it was supposed to do — aborted engine five, and it went through the remaining engine shutdown," said Shotwell. "An analysis of launch failure history between 1980 and 1999 by Aerospace Corporation showed that 91% of known failures can be attributed to three causes: engine failures, stage separation failures and, to a much lesser degree, avionics failures." SpaceX's next prospective launch window will occur on May 22, at 3:44 a.m. EDT.